← Will a renewable technology increase the value of your home? British Gas is one of the first of the big companies involved with the Green Deal to announce what they will be charging for the Green Deal Assessment Report (GDAR). They are likely to be the price leader and it is expected that most companies and independent Green Deal Assessors will follow their lead. It is therefore very likely that this will be the market rate, at least before competition starts to drive the price down. What is a Green Deal Assessment Report (GDAR)? 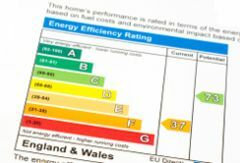 The Green Deal Assessment Report is a ‘bolt on’ to the Energy Performance Certificate (EPC) that most people are familiar with from buying, selling or renting domestic property. The EPC uses assumptions about the occupants based on the size of the home to derive a “standard occupancy”. This is used to calculate the energy performance of the property, however it can vary significantly from reality; nobody is “standard” and depending on our lifestyle we will use more or less energy than this measure predicts. The Green Deal Assessment Report takes the measurements of the fabric of your house (wall type and insulation) and the services (heating system, etc.) combined with actual observations of energy usage and predicts the actual and potential energy usage for the property. It also suggests a number of measures that can be fitted to reduce energy consumption, which can be delivered through a Green Deal finance package. How much does a Green Deal Assessment Report cost? With British Gas offering £99 it is hard to see anyone varying from this much, however there are concerns about the feasibility of delivering a report of this kind for this price. You’ll get a fully portable Green Deal Assessment which will include an EPC, around 2 hours with a fully qualified expert who will advise on your home’s energy efficiency and who will make unbiased recommendations for energy efficient products that suit your home. They will go through the Green Deal Assessment Report with the customer in the same visit and will explain the GDAR and the options available to the customer. Apparently there are no additional charges for subsequent visits. Should the homeowner choose to go with a different Green Deal Provider to the one the assessor is affiliated with to fit the measures they can do; the GDAR is completely portable. Two hours isn’t long to complete an EPC and a Green Deal Assessment Report – and you have to have a valid EPC before you can start the GDAR. Traditionally the EPC was not completed and lodged (submitted) on site as this allowed the assessor to contemplate the building before submission, and for an accurate Green Deal Assessment Report you must start with an accurate EPC. This means that the EPC component will have to be more ‘rushed’ than usual. Are these insurmountable concerns? No. This does mean, however, that the price of assessment is unlikely to come down much from £99 as you do get a lot for your money. This entry was posted in Grants, Offers & Funding and tagged EPC, GDAR, Green Deal, SAP. Bookmark the permalink.